Let your Crock Pot do the cooking! 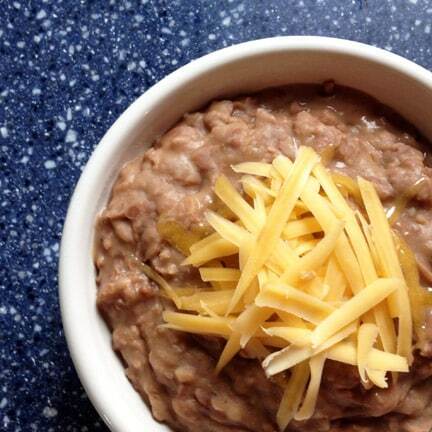 Make delicious, nutritious, refried beans in your slow cooker–with your choice of spices and seasonings. I’m not much of a bean eater, but the rest of the crew loves refried beans with their chips and tacos. Cans of Rosarita beans are inexpensive (about $1 each at Costco), but I knew I could do better. Besides, I have a long and storied history of making things instead of buying them. This is a perfect recipe to help get your kids in the kitchen. Crock Pot cooking is safer than stovetop, and little hands can measure and pour ingredients easily. They can even chop onions with a butter knife if they can stand the smell! 4.5 quart Crock Pot or Instant Pot: both of these awesome kitchen items help make refried beans from scratch. Use the ‘slow cooker’ setting on the instant pot. Immersion blender: a great kitchen tool to get a super smooth texture to your refried beans. You can use a potato masher for a more “chunky” texture. News flash! You don’t need to soak your beans before cooking. Just dump everything into the Crock Pot and add plenty of water (at least a couple of inches above the beans). Cover and cook on low for 6 hours. 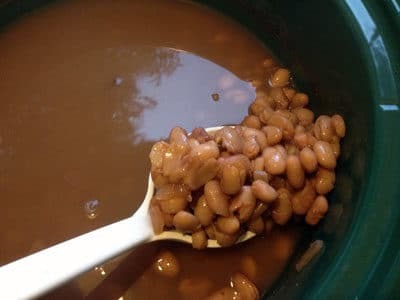 The beans are done when they are tender and starting to split. Taste and adjust seasonings if desired. Scoop beans out into a big bowl, keeping the cooking liquid in the pot. Mash the beans, adding cooking liquid as needed, until they’re your favorite consistency. My crew likes them lumpy, so I use an old-fashioned potato masher. If you prefer a smoother consistency, use an immersion blender. Makes 6 cups (equal to 3 cans). This is fabulous. The only ingredient I needed to buy was the beans, which were $1.39. The onion and garlic were from the garden, and I had the other spices already on hand. This makes each “can” of beans just 46c. If I’d bought the beans at Costco, they’d have been 78c a pound–for a grand total of 26c a can. Grab some chips and taco fixins and dinner is served! You don’t need to soak your beans before cooking. Just dump everything into the Crock Pot and add plenty of water (at least a couple of inches above the beans). Broken AC, Tupperware, and smoothies–oh my! Thank you for this! It is exactly what I’ve been looking for! Pinned it! I am making these tomorrow once I buy a bag of beans! Although I don’t have a crockpot, so I will do them on the Stove! I should really buy a crockpot! Where’s the LARD? Gotta have some LARD for really good refried beans! You know, the stuff that clogs up arteries something awful? Who needs arteries anyway! Overrated! I was thinking the same thing. I’m wondering if my palm shortening would do the trick since it is good for you and has no flavor at all? Love it, my 14 yr old loves refried beans, and I have not been able to find them with out GMOs. So good to have a recipe, pinning to my healthy eating board. Followed you here from Natural Living Link Up. Consider sharing on Tuesdays With a Twist, runs through Saturday. If you don’t have time to make, Amy’s has a good low sodium non gmo refried beans. This sounds yummy, easy and frugal…I just read a post about frugal being the new F word! Visiting from SSF. This sounds like a great crock pot recipe! 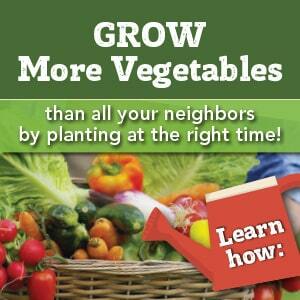 I’m going to share it on our G+ group, The Crock Pot Crowd and on our Pinterest board. Thanks for posting at LOBS! Yum! A great side to make at the start of the week and stretch over several meals. Can you can it when you are done to preserve some for later? I haven’t canned yet, but am trying to figure out what works. Thanks for sharing on Tuesday Greens! 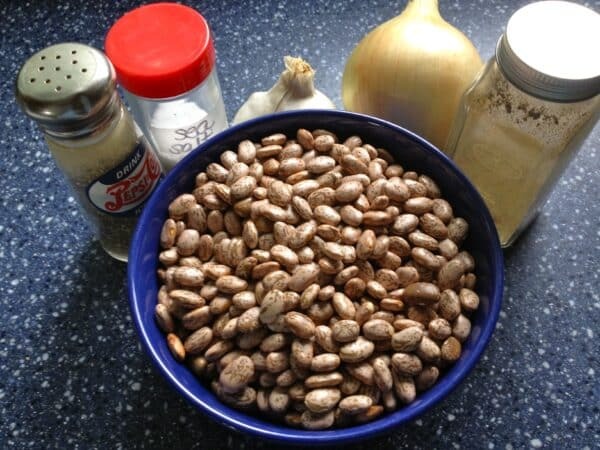 We love refried beans… thanks for the recipe! How many cups is one lb of beans? I buy it in bulk, not by the bag. Thanks! Have you ever frozen part of the recipe? Would love to make this instead of buying expensive cans of the non gmo stuff! Yes! I freeze portions in canning jars (remember to leave room in the jars for expansion from freezing) and they reheat just great. So Yummy! I added a little salt after I blended them. I was licking the spoon and bowl I thought it was so delicious! I made this recipe a few months ago and it is my new favorite. I haven’t bought refried beans since then. I haven’t tried any other recipe and i don’t intend to because this one is amazing. So flavorful and easy! I love it!! How about a print option. I would love to print this out. So Yummy!! Can’t wait to try this.